Comments: The Hatton Post Office began operation at Brown's Landing (now called Hatton) in late 1883. 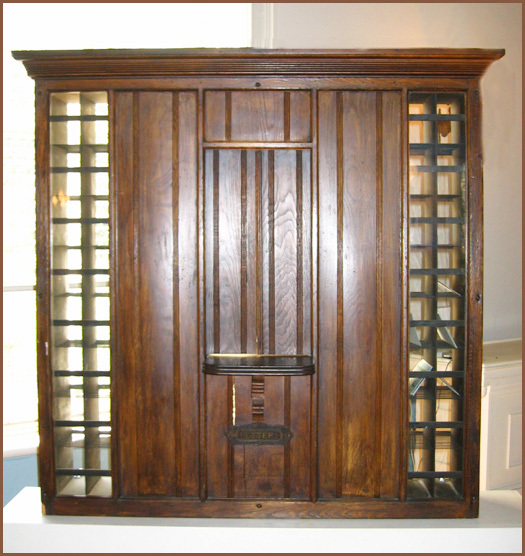 The postal facility sat just inside the front door of Brown's Store and contained walnut mail boxes (shown above) for its customers and a wooden window through which mail and stamps were dispensed. Although a post office most often assumes the name of its geographical location, there was already a Brown's Post Office operating at Brown's Cove in northwestern Albemarle; two Brown's Post Offices in the same county would have caused considerable confusion. Thus James Brown, who owned the ferry and store at Brown's Landing, named the post office, Hatton, in honor of Frank Hatton whose signature as assistant U.S. Postmaster General appeared on postal documents at that time. 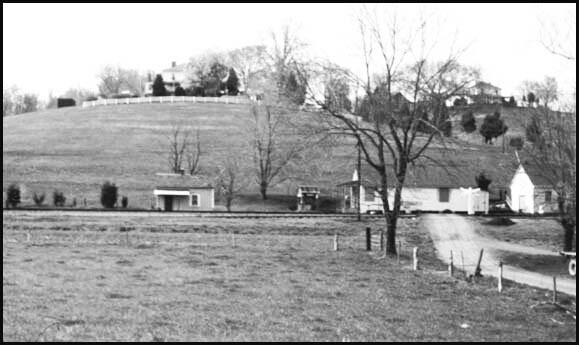 Located one hundred feet from the Richmond and Allegheny Railroad (later known as the Chesapeake and Ohio Railroad) track, the Hatton Post Office received mail daily via trains from Lynchburg and Richmond. If there were no parcels to be delivered to or picked up at Hatton, the train slowed but didn't stop. Instead, the Hatton Station agent hooked outgoing bags of letters to a pole which the train mailman scooped into the train as it passed through the station. The train mailman also tossed out a postal bag containing incoming mail to Hatton, and the postmaster lugged it up to the store for sorting into the appropriate mailboxes. For parcel pickup, the Hatton Station agent put up a green and white flag to alert the train engineer a mail pickup was required, and the train stopped at the station to do so. When the C&O Railroad closed Hatton Station in 1950, trucks began daily deliveries of mail to Hatton Post Office. Hatton Post Office serviced postal customers on both sides of the James River. Normally, its customers came to the post office to pick up their mail, and Buckingham clients used the ferry to cross the James River to Hatton. Some folks came four times a week to check on their mail; others picked up their mail once a week when they came to trade at the store. When the James River was flooded, ferry crossings could not be made safely without risking damage to the boats or passengers. But floods or high water did not stop mail reception by Hatton postal customers in Buckingham County. Their mail was delivered to them by Hatton employees. Many fondly remember Harvey Briddle, a devoted Hatton ferryman in the 1930's and 1940's who had suffered a crippling injury to his legs earlier in life. On many such high-water occasions, Harvey paddled a canoe up the flooded James River to deliver mail to Buckingham. In 1906, James Benson Tindall rented Brown's Store and renamed it J.B. Tindall's Groceries. It is not known who processed Hatton mail the first two years of Tindall's store management. On March 24, 1909, however, the U.S. Postmaster General appointed Tindall to be Postmaster of Hatton. In those times, storekeepers often were the postmasters because they knew how to keep expense ledgers and handle money. Tindall certainly was good at the job and served continuously as Hatton's Postmaster until his death in 1945. His son, James Benson Tindall, Jr., received the federal appointment to succeed his father as postmaster, and served as Hatton's postmaster until Jim's retirement on February 28, 1975. 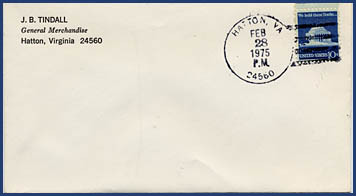 Hatton Post Office closed on that date, too, and below is one of the last envelopes postmarked at Hatton by Postmaster James Benson Tindall, Jr. The original wooden post office, shown in the top photo, belongs to Virginia Tindall Schilder of McLean, Virginia. Virginia generously allowed Scottsville Museum to photograph this post office and also to use this historic artifact in our 2004 exhibit entitled Timeless Treasures. Virginia is the youngest daughter of James Benson Tindall, Sr. The photographs above are part of the James Benson Tindall, Jr., collection. James is the son of James Benson Tindall, Sr., and a former postmaster of Hatton; in 2004, he resides in Scottsville, Virginia.